On 3 April, the Colorado Senate Passed Bill 181, Protect Public Welfare Oil and Gas Operations, which concerns additional public welfare protections regarding the conduct of oil and gas operations. The bill prioritizes the protection of public safety, health, welfare and the environment in the regulation of the oil an gas industry by modifying the oil and gas statute and by clarifying, reinforcing and establishing local governments’ regulatory authority over the surface impacts of oil and gas development. The bill is now expected to be signed by Colorado Governor Polis. would remove experts in engineering and geology from the COGCC, the 9-member panel responsible for making oil and gas regulatory decisions in Colorado. For more information about how IADC is engaging on this topic, please contact Rhett Winter at Rhett.Winter@iadc.org. On 31 March, a Federal judge in Alaska ruled that the Executive Order issued by President Trump in April 2017 that would have opened previously closed waters in the Arctic and Atlantic Coast to oil and gas drilling is unlawful. President Obama put restrictions in place in 2015 and 2016 that banned Arctic drilling in roughly 125 million acres of the Arctic coastal shelf in Alaska. The new ruling affirms that President Trump’s Executive Order overstepped his authority, and that under Section 12(a) of the Outer Continental Shelf Lands Act, only Congress has the authority to reverse prior withdrawals. The ruling does not affect existing oil and gas leases in the Beaufort Sea. The ruling is expected to be appealed to the Ninth Circuit Court of Appeals. On 2 April the Pass USMCA Coalition, an alliance advocating for swift passage of the United States-Mexico-Canada Agreement, of which IADC is a member, added eight groups to its ranks: The Latino Coalition, the National Milk Producers Federation, the National Small Business Association, the Northwest Horticultural Council, Schneider Electric, the Software & Information Industry Association, the U.S. Dairy Export Council, and WineAmerica. In March, the U.S. House passed the Paycheck Fairness Act, a resolution expressing the sense in Congress that the Robert Mueller report should be released to the public, among other bills and resolutions. In the House Natural Resources Committee, a hearing was conducted on examining the polices and priorities of BOEM and BSEE, along with another hearing on the budget priorities at the Department of Interior. The Senate Energy and Natural Resources Committee conducted a hearing to review the qualifications of David Bernhardt to become the next Secretary of the Interior. He currently serves as Deputy Secretary and was nominated for the top spot when former Secretary Zinke vacated the position. In addition, the full Senate voted on the New Green Deal climate resolution aimed at eliminating fossil fuels. The procedural vote on the measure, S.J. Res 8, failed 0-57 as most Democrats voted present to protest what they perceived to be a shame vote. The 400-plus-page Mueller report was sent to the Attorney General. A federal judge in Alaska issued a ruling blocking a 2017 Trump Executive Order that would have repealed an Obama Administration move that created sanctuaries in Alaska and other places offshore restricting them from various activities, including drilling. President Donald Trump repeated his threat to close the southern border, saying that U.S. “detention areas are maxed out & we will take no more illegals,” at a time the U.S. has moved to cut aid to Central America. The President also issued a new permit for TransCanada Corp.’s controversial Keystone XL pipeline Friday, doubling down on his commitment to the project after a court ruling blocked his previous permit. A “Human Performance in Well Control Workshop” was recently coordinated by IADC in conjunction with the SPE/IADC 2019 International Drilling Conference in The Hague, Netherlands. About 50 human factors, well control and HSE professionals attended the invitational event. The event featured sessions on the foundation principles of human performance, the importance of cross company collaboration, and applications and tools available to the industry. Presentations were made by Shell, BP, IADC, Chevron, KCA Deutag, Aramco Overseas, Maersk Drilling and Baker Hughes/GE. Other suggestions included funding and resources an industry organization focused on human performance in addition to following efforts already underway by major operators, IADC and IOGP. Members of the organizing committee are continuing to meeting to discuss how to best follow up to the workshop. The event was sponsored by BP, Shell, Total and Baker Hughes/GE. The workshop had originally been proposed by Shell during the June 2018 Board meeting of the Well Control Institute, an organization focusing on well control under the auspices of IADC. For more information, contact Steve Kropla at Steve.Kropla@iadc.org. In late March, the U.S. Department of Labor announced a proposed rule to amend and update their regular rate requirement under the Fair Labor Standards Act (FLSA). The FLSA generally requires overtime pay of at least one and one-half times the regular rate of pay for hours worked in excess of a 40 hour workweek. Regular rate requirements define what forms of payment employers include and exclude in the “time and one-half” calculation when determining workers’ overtime rates. The Notice of Proposed Rulemaking was included in the 29 March, 2019 Federal Register, interested parties may submit comments on the proposal at www.regulations.gov in the rulemaking docket RIN 1235-AA24. The deadline to do so is May 28, 2019. On 15 March, Interior’s Bureau of Land Management (BLM) issued Records of Decision (RODs) amending land use plans for Greater Sage-Grouse habitat management on public lands, providing special protection measures for nearly 60 million acres. The decisions received bipartisan support from the governors who sought revisions to the plans that guide conservation of sagebrush steppe habitat on BLM-administered public lands in their respective states. The goal was to better align BLM plans for managing habitat with state plans for conserving the species. The decisions affect resource management plans for BLM-administered public lands in seven Western states, where the BLM manages habitat and states manage wildlife species. The plans build on those put into place in 2015. In 2017, the BLM began scoping for the new plans asking whether “some, none or all” of the 2015 sage-grouse plans should be amended. The planning effort that concludes with the March decision began in 2017 when governors of most of the affected sage-grouse states asked the BLM to revisit existing plans for managing sage-grouse habitat and adapt them to better meet the needs of individual states. In response, the BLM proposed changes developed in collaboration with governors and state wildlife agency professionals in the seven affected states, as well as other concerned organizations and individuals, largely through the Western Governors Association’s Sage-Grouse Task Force. More information can be found at the BLM website. In late March, the State of New Mexico’s Energy, Minerals and Natural Resources Department announced that Adrienne Sandoval would lead the Oil Conservation Division for the state. The Division regulates oil and gas activities in New Mexico. The Wyoming Office of State Lands and Investments held the first oil and gas lease auction for 2019 on 19 March. The auction resulted in 173 of the 206 offered parcels receiving successful bids to lease 54,096 acres. The auction grossed $4,535,748.08 for the benefit of the State’s trust beneficiaries. Revenue generated from the auction will be distributed to support public education, the farm loan program, state penitentiaries, and other State funded programs. All leases resulting from winning bids will be issued on the lease form currently in effect as approved by the Wyoming Board of Land Commissioners as Lessor: for a primary term of five years, rental of $1.00 per acre and a royalty rate of either 16 2/3% or 12 ½% of the production as indicated on the pacel listing. More information can be found on Wyoming’s Office of State Lands and Investments website. IOGP recently announced the publication of the IOGP-IPIECA Report 626 – Managing Fatigue in the Workplace. IOGP-IPIECA have previously developed four publications to assist the oil and gas industry in managing fatigue. This publication supersedes the preceding documents by bringing together and updating all the elements of the previous publications, which include Report 392 – Fatigue Management in the Workplace; Report 488 – Performance Indicators for Fatigue Risk Management Systems; Report 492 – Assessing Risks from Operator Fatigue and Report 536 – Fatigue Fly-in, Fly-Out Operations. The new report is now one resource to help organizations to implement, monitor and manage fatigue risk management systems. Report 626 comes with three supplementary documents and file packages which expand upon and provide implementation tools for the main report. To access all of the materials and to download, please visit the IOGP website. After 28 years with IADC, Mike Killalea retired from IADC in March, leaving a legacy of mentorship and innovation. Mr. Killalea joined the association in 1991 as Associate Editor of Drilling Contractor magazine and retired as Group Vice President and Editor/Publisher. Throughout his career with IADC, Mr Killalea was instrumental in the establishment of the IADC ART Committee, and the IADC World Drilling Conference and he assisted in the development of the first electronic version of the IADC Drilling Manual and oversaw the 12th edition of the same. Under his direction, 167 issues of Drilling Contractor magazine have been published and he launched the Drill Bits newsletter and eNews from drillingcontractor.org, establishing IADC as a leader in video and multimedia content for the drilling industry. 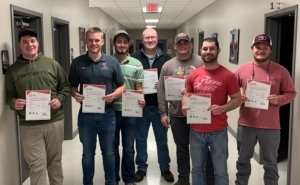 On 6 March, eight petroleum engineering drilling students from the University of Louisiana-Lafayette received their IADC RigPass certification at M&A Safety Services in Youngsville, Louisiana. The students completed the eight-hour course and the 100 question exam. On 13 March 1974, the International Petroleum Industry Environmental Conservation Association (IPIECA) was established at the request of the United Nations Environment Programme to develop a shared industry response to environmental and social issues. IPIECA remains the global oil and gas industry’s principal channel of engagement with the United Nations. From a handful of founding members, IPIECA’s global membership now stands at 39 companies, operating in 180 countries and employing 1.1 million people. Looking forward, IPIECA will continue to use its unique position within the industry to develop, promote and share good practices with the oil and gas sector, forming new alliances and partnerships to continue advancing environmental and social performance across the industry. In February, IADC’s Accreditation Department successfully passed the ISO 9001:2015 recertification audit with zero findings. IADC remains the only well control accrediting body to hold ISO 9001:2015 certification, demonstrating the association’s ability to consistently provide services that meet customer requirements while keeping a focus on quality and integrity. Programs that fall under the ISO certification include RigPass, SafeLand, SafeGulf, WellSharp, WellCAP Plus, DIT, Competence Assurance, Gateway and Crane-Rigger. The ISO 9001 QMS standard requires that a company identify and describe processes using business metrics, the purpose of which is to better manage and control business processes. The ISO 9001 family addresses various aspects of quality management and contains some of ISO’s best-known standards, which provide guidance and tools for companies and organizations that want to ensure that their products and services consistently meet customer’s requirements. ISO 9001:2015 sets out the criteria for a quality management system and is the only standard in the family that can be certified to. This standard is based on a number of quality management principles including a strong customer focus, the motivation and implication of top management, the process approach and continual improvement. The IADC Rig Moving Committee has scheduled their next meeting for 24-25 April in Oklahoma City. The group is currently working to revise the rig moving chapter of the IADC Drilling Manual to include information pertaining to 24-hour rig moves. The IADC Advanced Rig Technology (ART) Committee recently elected new committee leadership. Robert van Kuilenburg, Noble Drilling was named Chair and Rob Shank, Parker Drilling, was named Vice Chair. Brian Garrett, Rowan Companies was named BOP Controls Subcommittee Chair; Mitch Eichler, Parker Hannifin was named BOP Controls Subcommittee Co-Chair; Nathan Moralez, BP remains Chair of the Drilling Control Systems Subcommittee with Assaad Mohanna, NOV named as Vice Chair. For more information about the ART Committee, please visit the IADC website. For more information about Drilling Matters, contact Amy Rose (amy.rose@iadc.org). Remote operation in the context of this regulation refers to plant to control the hazard which is operated away from the immediate hazard. Weatherford Drilling Int’l: Rig 867 (8), Iraq Support Team (1).